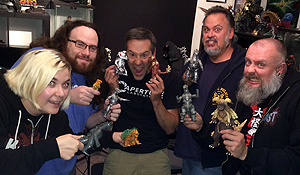 Rachel, Bryan, Martin, Jeff & Kyle talk mechanical monsters in the newest episode of the Kaijucast! …Welcome to another installment of the Kaijucast – episode 93, to be exact and squeaking in just before the world’s calendars flip to October! We are talking about the 1974 Godzilla vs. Mechagodzilla this month. This film was one of the first Godzilla films I had ever seen and I think it holds a fairly nostalgic spot in my heart and it’s pretty obvious that the rest of the crew likes this one too. We had a really great response to this film from the listeners, but I was some surprised at some of the negativity this film garnered. Don’t get me wrong, there was a lot of love, too. Because I’m heading to Japan at the end of October, there is NO homework and consequently no discussion for October. Don’t worry, we will still post two episodes, but all of you are off the hook for the next six weeks. Maybe you can use that time to work on an awesome Godzilla/kaiju-related halloween costume!